With spring right around the corner, I have been preparing my favorite "winter" meals one last time. One of my favorite winter meals is Cowboy Beans. As a kid, nothing tasted better after a playing outside for hours in a Wisconsin winter than a heaping bowl of Cowboy Beans. Many years have past since I've spent hours playing outside, but this dish is still one of my favorite comfort foods. Living a thousand miles away from where I grew up, I miss my family something fierce. When my homesickness gets to be too much to handle, I often pop this in the slow cooker and let the memories of my family gathered around our table on cool winter days settle my soul. Cook bacon until crisp (then crumble and set aside). Brown the beef until no pink remains (drain and set aside). Combine all ingredients in a crock pot. Set crock pot to high for 4 hours. I often double the batch so that we can munch on it for a couple days. You can also easily substitute the types of beans to fit what you and your family like. Every summer my parents piled us kids into the family car, and together, we set out to explore the beauty of North America. We always had a destination in mind, but the path on which we would arrive there was organic and every changing. Our trips weren't just about driving through the park. They taught us how to respect and mingle with nature. My father was never one to miss pointing out a specific plant, animal, or tree while on a hike. My mother shared stories with us about historical events and curiosities about each area we passed through. We frequented and grew to love historical markers and visitor centers. Theses trips weren't just educational, they were a time for us to bond. A time for us to all step away from our busy schedules and relax. At the mention of spending two weeks stuck in a car with your family, most kids would protest... loudly. But not us Heisz girls, we would look at maps and plan outrageous side trips to see the locations of our favorite books (De Smet, SD, and Chincoteague) or the hometown of our favorite athlete (Kiln, Mississippi). We couldn't wait to get on the road. Even in our excitement, we fought like all kids do when locked in a car together for hours on end. My parents devised a solution in the form of a "fight jar". The jar was an old 35mm flim container and for each fight we got into (no matter who started it) we had to put a quarter in the fight jar. The quarters collected more quickly on some trips than others and were always used for something super lame, like laundry or gas. I think I speak for my sister and I both when I say that our fondest fight jar memory was on a trip out to Montana with our parents and three cousins. Not a single coin was put in by us kids on the entire trip, but we can't say the same thing for our parents! Not every trip went off without a hitch. I don't think any of us will ever forget our trip to Sault Ste. Marie, Ontario, Canada. That unforgettable trip started with all five of us packing into my Dad's Ford Ranger pickup (my older sister and I sat in the jump seats - cozy, right?) and ended up with me running a fever so I high that I was hallucinating and had to be taken to the hospital. Even with all of that kicking and sickness, I still have great memories from that trip and hope someday to repeat our ride on the Agawa Canyon Train Tour with my children. Shortly after that fateful trip to Canada, my parents made sure that our future trips were taken in the comfort of the family van. We would load the van with camping gear (more often than not), picnic lunches, a snack box, and activity packs. My parents would take turns driving, and as we got older, us kids even took our turns at driving. I will never forget when I woke up from a nap and (loudly) freaked out when I saw that my newly-licensed older sister was driving the full-size conversion van down the freeway! After our first few road trips, my sisters and I started ranking campgrounds (ones with showers and pools ranked highly), rest stops (Mississippi is a favorite as they gave out free cups of Coke, South Dakota ranked low because many of them have pit toilets), and hotels (just because we were on a budget didn't mean a pool and a continental breakfast with a waffle maker weren't important). My younger sister Courtney and I still rank amenities based on this scale today - having just added West Virginia to the short list of states with nice rest stops on our recent genealogy road trip due to their superb bathrooms and historical information features. Growing up, I understood what an opportunity these trips were, but it wasn't until I was older that I was able to fully understand the sacrifices my parents made to make them a reality. My parents felt that it was essential to our up-bringing that we were exposed to different cultures, natural wonders and the experiences that came along with that exposure. I am eternally thankful that my parents worked as hard as they did to save up for these trips and sacrificed the finer things in life to teach us that the experiences we have in our lives are much more important than any monetary thing we could collect. As a result, many of my most cherished memories come from these family adventures. This is a follow-up to my two posts on our individual results from 23andMe's Top Relative Surname finder that shows the popularity of the surnames in our relative finder matches. I currently have 988 people in my relative finder, while my maternal grandmother only has 986. Our numbers are different because the test incorporates both maternal and paternal lines into it's results. In my previous posts about this feature, I just shared our top five surnames. The service actually let's you view any surname that is listed at least five times in the profiles of your matches. I currently have 124 surnames and my grandmother has 51. Below I've listed the top 10 surnames in my grandmother's list and have indicated in parentheses where they were found on my list. It's interesting to note that six of her top 10 surnames were not in my list. Below I've listed the top 10 surnames in my list and have indicated in parentheses where they were found on my grandmother's list. It's interesting to note that only two of my top 10 surnames were in her list. As you can see, even though we are closely related, our results are quite different. These results should be fluid and I will explore them periodically to see how they have shifted. 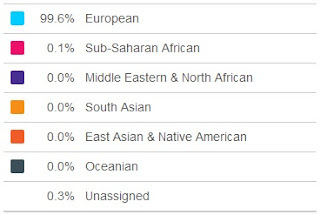 I was recently looking back over my personal 23andMe genetic genealogy results (Test 3) and discovered an interesting feature: Top Relative Surnames. 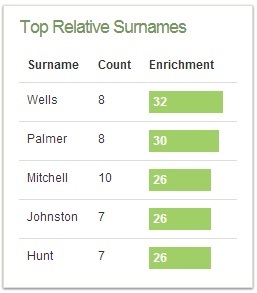 The Top Relative Surnames feature shows how popular the surnames in my relative finder matches. Currently, my relative finder section is showing the results for 988 participants. My top five surnames are Pragle, Gawton, Andriessen, Walker, and Garner. The count column shows how many times the name is shown in the profiles of my matches, while the enrichment columns shows how common a surname is in my entire relative finder matches. I'm interest to see how often this changes as more people are tested and added to the database. The Ancestry Composition (provides you with a percentage breakdown of your DNA in the 22 worldwide populations) results were a different story. 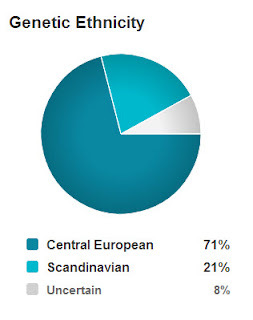 These results are a combination of both my maternal and paternal lines, so I knew they wouldn't match G-Ma's exactly, but I wasn't expecting the results. My results showed that I am 99.7% European, 0.1% East Asian & Native American, <0.1% South Asian, and 0.2% unassigned. I was pretty confident that my European percentage would be that high, but was not prepared to see East Asian, Native American, or South Asian. 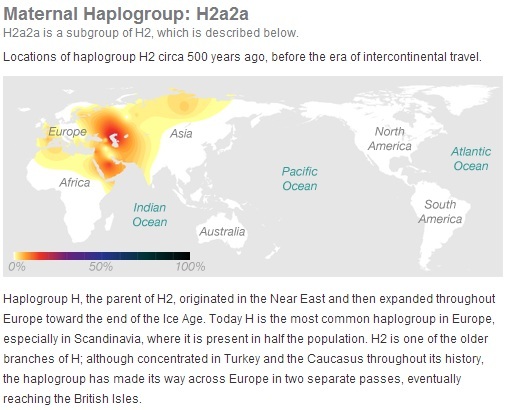 Obviously, these results are reflected from my paternal line and I am not sure my reach will ever be deep enough to match ancestors with these areas. Of course, that's not going to stop my from trying and explore this through the relative finder area of the 23andMe database.